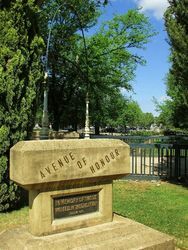 A monument commemorates the Avenue of Honour and those who died in service or were killed in action during World War One. 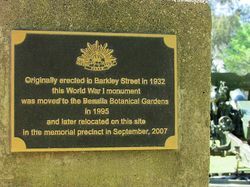 The Avenue of Honour originally lined both sides of Barkly Street with thirty silky oak trees, planted on the 3rd August 1918. The avenue was completed in 1934 and the monument was unveiled during the official ceremony. The avenue no longer exists and the monument which marked where the avenue once stood is now in the Botanical Gardens. The official ceremony in connection with the Avenue of Honor in Barkley Street was completed on Saturday in the presence of a large attendance and took the form of the planting of trees and the unveiling of a memorial tablet. The Benalla Band led by Drum-major W. Davis, led the band from Bridge Street to the intersection of Bridge and Church Streets, where a temporary platform had been erected for the occasion. The afternoon was presided over by the shire president (Cr. T.F. Harrison) and on the platform were Messers H.J. Guppy (Dad's Association), Mr Garson (acting president of the R.S.S.I.L.A.) and Mrs G. T. Say (Women's Auxiliary of R.S.L. In opening the proceedings, Mr Garson said that the avenue had been commenced 17 years ago and it was felt that it should be completed and the Women's Auxiliary took the first move in the matter. It was soon felt that those concerned in the movement had the hearty co-operation of townspeople and various organisations. Mr W. Heywood also took an interest in the movement and he collected £11/2/ in contributions and the Diggers voted £30 also. 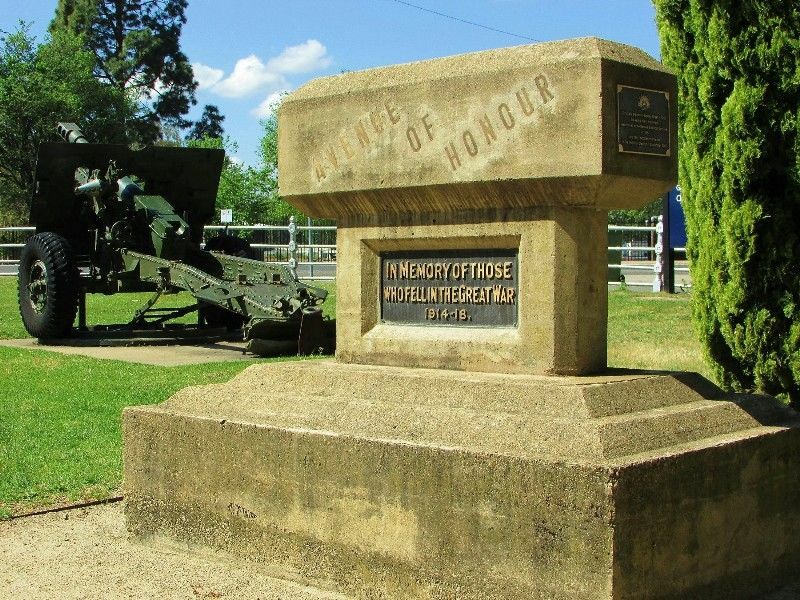 The Shire Council also rendered assistance by supplying the trees and memorial tablet. He said that it had been a great pleasure to all to find that they had not to go begging and that they had had the co-operation of all. He then called on the Shire President to plant the first tree. In doing so, Cr. Harrison said that it gave him much pleasure to be present that afternoon to complete the avenue, which was first started by Mr Clive Waters 17 years ago. He said that the trees would be a memento for the children and hoped that they would be looked after. 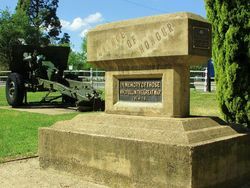 Headed by the Band, the people marched to the Tablet at the intersection of Bridge and Church Streets where it was unveiled by the Shire President, after which the Last Post was sounded. This was followed by "Lest We Forget" by those present and singing of the National Anthem brought the proceedings to a close.